Please read these terms and conditions carefully. They contain disclaimers of warranties, representations, conditions, guarantees and endorsements; exclusions and limitations of liability; waivers of rights and acceptance of risks in relation to access to and use of this Site and the information, products or services it contains or offers. By accessing this Site, you acknowledge these terms and conditions and agree without limitation or qualification to be bound by them and by applicable laws. If you do not agree to these terms and conditions, do not access this Site or any pages thereof. “Information” means the information, materials, and content provided in the pages of the Site. “Personal Information” means any information about an identifiable individual within the meaning of section 3 of the Privacy Act. Personal Information includes, without limitation, information relating to identity (including the name or other identifier assigned by BDC to an individual), nationality, age, gender, address, passwords, telephone number, e-mail addresses, marital status, education, employment and health history, assets, liabilities, payment records, income and information relating to financial transactions as well as certain personal opinions or views of an individual. “User” means any person having access to or using a Site. The Site is owned by Greybrook Capital. Greybrook may monitor access to, use of, and other activities relating to the Site, and may intervene in relation thereto but does not make any representation or warranty that it will do so. Users hereby consent to any such monitoring and intervention. h. forge, alter, or modify in any way any of the agreements, policies, reports, or other Information posted or accessible within this Site. At Greybrook’s sole discretion, Greybrook may terminate or refuse to permit the use of any services and of this Site by any person or entity, for any reason and without notice. The content of Greybrook’s Site is provided for information purposes only, unless otherwise indicated, and is not intended to provide specific financial, investment, tax, legal, or accounting advice to Users, and should not be relied upon for that purpose. Users should not act or rely on the Information without seeking the advice of a professional. Products, solutions and services of Greybrook are only offered in jurisdictions where they may be lawfully offered. All products, solutions and services of Greybrook are subject to the terms and conditions of the applicable agreements governing their use and these terms and conditions are to be read together with the Terms and Conditions of the Site. The Information on this Site does not constitute an offer or solicitation by anyone in any jurisdiction in which an offer or solicitation cannot legally be made, or to any person to whom it is unlawful to make an offer or solicitation. For Information specific to any specific provincial jurisdiction, Users should contact their advisor. If Users choose to access the Site from outside Canada, they do so on their own initiative and are responsible for compliance with applicable local, national, or international laws. Users must be aware of the laws of their country or that otherwise apply to them in relation to any of the matters described in these pages. Users may not use, export, or re-export the Information or any copy or adaptation in violation of any applicable laws or regulations, including export laws and regulations of Canada in force from time to time. Despite its best efforts and the measures taken by Greybrook to ensure the protection of Personal Information, the risk that the confidentiality or privacy of such information is violated, lost, or otherwise breached cannot be excluded. It is therefore understood and agreed that access to or use of the Site is at the User’s own risk, which he hereby accepts, and entails waiver of any rights or remedies against Greybrook for any prejudice whatsoever arising out of or in connection with the exchange, collection, use, disclosure, retention, or disposal of Personal Information. Greybrook is not responsible for and shall not be liable to the User or other persons for any claims, losses, costs, expenses, or damages whatsoever arising out of or in connection with the exchange, collection, use, disclosure, retention, or disposal of Personal Information, except in cases where such prejudice results directly and entirely from the negligence of Greybrook in the performance of its legal obligations under the Privacy Act. Any unencrypted e-mail communication over the Internet is, as with communication via any other medium, such as cellular phones, not secure or confidential, and is subject to possible interception, loss or alteration. Greybrook does not encourage anyone to send information, including Personal or Loan Information, to it using unencrypted e-mail. Alternative, secure means of communicating with BDC over the Internet are available. Greybrook is not responsible for and shall not be liable to Users or any other person for any damages in connection with an e-mail sent to Greybrook, or by Greybrook at User’s request. Links from or to other Web sites or Internet resources outside the Site are meant for convenience only and are at Users’ own risks. The content, third parties named therein or their products and services, opinions expressed and other links provided by these sites’ resources are not reviewed, investigated, verified, monitored or endorsed by Greybrook. Greybrook makes no representations whatsoever about any other Web sites which Users may access through the Site, and BDC shall not be responsible or liable for any damages in connection with linking. While every effort is made by Greybrook to ensure that all software provided at this Site is suitable for use on a wide variety of computer systems, Users should take reasonable and appropriate precautions to scan for computer viruses, and ensure compatibility of the software with their specific computer system. Users must also ensure that they have up-to-date backup copies of the entire contents of their hard disk before installing software downloaded from this Site. Links to downloadable software sites are for convenience only and Greybrook is not responsible or liable for any difficulties or consequences associated with downloading the software. Use of any downloaded software is governed by the terms of the license agreement, if any, which accompanies or is provided with the software. If Users choose to access a software program through one of the links offered on Site, they are responsible for taking the necessary precautions to detect possible viruses and ensuring that the software is compatible with their computer. Certain names, words, titles, phrases, logos, icons, graphics, designs or other content in the pages of the Site are trade names or trade-marks owned by Greybrook, or trade names or trade-marks licensed to them. The display of trade-marks and trade names on pages in the Site does not imply that a licence of any kind has been granted to anyone else. The Information is for Users’ personal use only. Any unauthorized downloading, re-transmission or other copying or modification of trade-marks and/or the contents of the Site may be a violation of federal or other law or common law rights that may apply to trade-marks and/or copyrights and could expose the copier to legal action. The Information is protected under the copyright laws of Canada and other countries. Unless otherwise specified, no one has permission to copy, redistribute, reproduce, republish, store in any medium, re-transmit, modify or make public or commercial use of the Information in any form. Greybrook does not give, make or set any warranties, representations, conditions, guarantees or endorsements, whether expressed or implied by law, statute, trade usage or otherwise, with respect to the functionality or conditions of this Site or the Information contained therein, including, without limitation, warranties as to merchantability, operation, non-infringement, title, usefulness, completeness, accuracy, adequacy, currency, reliability or fitness for a particular purpose. Without limiting the generality of the foregoing, Greybrook does not give, make or set any express or implied warranties, representations, conditions, guarantees or endorsements to the effect that the Information, accessed from or through this Site will be uninterrupted or free of errors, omissions, defects, viruses or other harmful components, or that any such problems which are discovered will be corrected. f. Greybrook’s failure to take corrective measures. The aforementioned exclusions and limitations shall apply whether any claims, losses, costs or damages are founded in contract (including fundamental breach), tort or any other theory of liability and such limitations and exclusions shall apply even if Greybrook has been advised of the possibility of such claims, losses, costs or damages. Because some jurisdictions do not allow the exclusion or limitation of moral, bodily, incidental or consequential damages, Greybrook’s liability in such jurisdictions shall be limited to the extent permitted by law. d. Users’ violation of any rights of another. Greybrook reserves the exclusive right, at Users’ expense, to conduct the defence and assume control of any matter, subject to indemnification by Users, in which event the User shall cooperate with Greybrook in asserting any and all available defences. The Site and the Terms and Conditions shall be governed by and construed in accordance with the laws of the Province of Ontario and the federal laws of Canada applicable therein, without giving effect to any principles of conflict of laws. All disputes, controversies or claims arising out of or in connection with the Site, including the Terms and Conditions contained therein, shall be submitted to and be subject to the jurisdiction of the courts of the Province of Ontario. By accessing and using this Site, Users submit and attorn to the exclusive jurisdiction of the courts of the Province of Ontario to finally adjudicate or determine any suit, action or proceeding arising out of or in connection with the Site, including the Terms and Conditions contained therein. Specific contracts for Greybrook’s products, solutions or services entered into via the Site shall be governed by, construed and subject to the laws and jurisdiction of the province expressly provided for in such contract and where none is specified, the laws and jurisction of the Province of Ontario shall be deemed to apply. a. Change to terms: Greybrook may modify, alter or otherwise update the Terms and Conditions applicable to this Site from time to time, without notice, by updating this posting. Users agree to review the Terms and Conditions regularly and to be bound by their continued access and use by such Terms and Conditions as are in effect at the time when they access Greybrook’s Site. b. Change to Information: The Information contained in this Site may be changed at any time without notice. c. Reservation of Rights: All rights not expressly granted in these Terms and Conditions are reserved to Greybrook. Nothing contained in these Terms and Conditions shall be construed as conferring by implication, estoppel or otherwise any licence or right under any copyright, patent, trade-mark or other intellectual right of Greybrook or any other person or entity. d. Survival: These Terms and Conditions apply while Users are accessing the Site and remain in effect thereafter. In the event that this Site is no longer accessible to Users, the provisions set out in Articles 6 and 9 to 14 inclusively of these Terms and Conditions shall survive thereafter. © 2016 GREYBROOK CAPITAL. ALL RIGHTS RESERVED. THIS WEBSITE DOES NOT CONSTITUTE AN OFFER TO SELL OR A SOLICITATION TO BUY ANY SECURITIES, NOR SHALL IT FORM THE BASIS OF, OR BE RELIED ON IN CONNECTION WITH, OR ACT AS AN INDUCEMENT TO ENTER INTO, ANY CONTRACT OR COMMITMENT WHATSOEVER. VISITORS TO THIS WEBSITE WHO ARE CONSIDERING MAKING AN INVESTMENT IN A SPECIFIC SECURITIES OFFERING ARE REMINDED THAT THEY MUST NOT MAKE ANY DECISION ON THE BASIS OF INFORMATION CONTAINED IN THIS WEBSITE BUT, RATHER, ONLY ON THE CONFIDENTIAL OFFERING MEMORANDUM RELATING TO THAT PARTICULAR SECURITIES OFFERING. PAST PERFORMANCE IS NOT AN INDICATOR OF FUTURE PERFORMANCE. Roberto is an experienced technology business leader and operator. He is currently deployed as CEO of Brandprotect, where he engineered the turn-around of the core business from declining revenues to 75% year-over-year growth. He also serves as the CEO of Nulogx, a leading canadian transportation management solutions company and publisher of the Canadian General Freight Index. Prior to joining Brandimensions, Roberto founded DME Consulting Inc., a management consulting firm specializing in strategy and M&A. Clients include Corel Corporation, AOL Canada, and BCE, where DME advised on several acquisitions with aggregate revenues north of $200 million. Prior to DME Consulting, Roberto served as CEO for SoftQuad Software Ltd., a company he acquired through a management buy-out and subsequently took public both in the U.S. and Canada. Previously, Roberto was president of Carolian Systems, a network management software solutions company. Elias is the Chairman and founder of Greybrook a private equity firm focused on Real Estate and Healthcare. Elias is also Chairman of Greenbrook TMS NeuroHealth Centers (TSX: GTMS), the leading provider of TMS Therapy in North America. Greenbrook clinics provide a novel treatment for patients suffering with depression. He is also chairman of TearLab Corporation (NASDAQ/TEAR, TSX TLB), an ophthalmic device company developing and commercializing novel, lab-on-a-chip technologies that enable eye care practitioners to test for highly sensitive and specific biomarkers in tears at the point-of-care. Prior to Greybrook, Elias co-founded TLCVision (NASDAQ/TLCV, TSX/TLC) where he served as President and CEO. Elias, as CEO, built TLC into the largest eye care service provider organization in North America with revenues of more than $300,000,000 as TLC opened or acquired more than 100 laser eye clinics, over 200 mobile laser sites, more than 250 mobile cataract locations several ambulatory surgery centers and through its subsidiary Vision Source Inc. developed the largest independent Optometric Franchise with more than 2,000 locations. TLC’s stock, listed on the TSX and NASDAQ since 1996, appreciated to well over $1 Billion during his tenure. Elias has received many management awards from industry and his peers including. Canada's Top Forty under Forty" in 1996. -an award that recognizes the top 40 Canadians under the age of 40. In 1999, Elias received the Presidential Medal of Honor from the Illinois College of Optometry. In 1999 he was named Ernst & Young's Canadian Entrepreneur of the Year for Innovative Partnering and Entrepreneur of the Year for Ontario in the Emerging Category. In 2000, Elias was recognized by Profit Magazine for managing Canada's fastest growing company (TLC) with over 25,000% growth over 5 years. In 2005 he was also voted "best of the best" by his peers. Sasha is an experienced private equity professional. As the CEO of Greybrook Securities, he directs Greybrook’s capital markets activities across the firm’s focus areas in real estate and healthcare. Sasha has completed over 50 acquisitions throughout the Greybrook portfolio and has been instrumental in expanding Greybrook’s roster of high net worth and institutional clients globally. Operationally, Sasha co-manages Greybrook Realty Partners’ business across both its Asset Management and Capital Markets verticals. His deep understanding of both operations and the capital markets has proven to be invaluable in leading the firm’s evaluation of prospective investments. Sasha serves as the co-chair of Greybrook’s advisory committee for all active limited partnerships, and the co-chair of Greybrook’s investment committee, which to date has managed $1 billion of investor equity, deployed across 60+ real estate development projects with an estimated completion value of more than $14 billion CAD. As the former CEO of Greybrook Health, Sasha played a critical role in the launch of Greenbrook TMS (TSX: GTMS) and Greybrook’s prior portfolio acquisitions of MacuHealth and Bruder Health Care. He currently serves on the board of Greenbrook TMS, as well as on the boards of a number of Greybrook affiliated companies and the Blu Genes Foundation, a charity dedicated to funding the advancement of the science of gene therapy for the treatment of various genetic disorders. After receiving a B.A. in Economics from York University in 2000, Sasha went on to play professional hockey for three seasons. 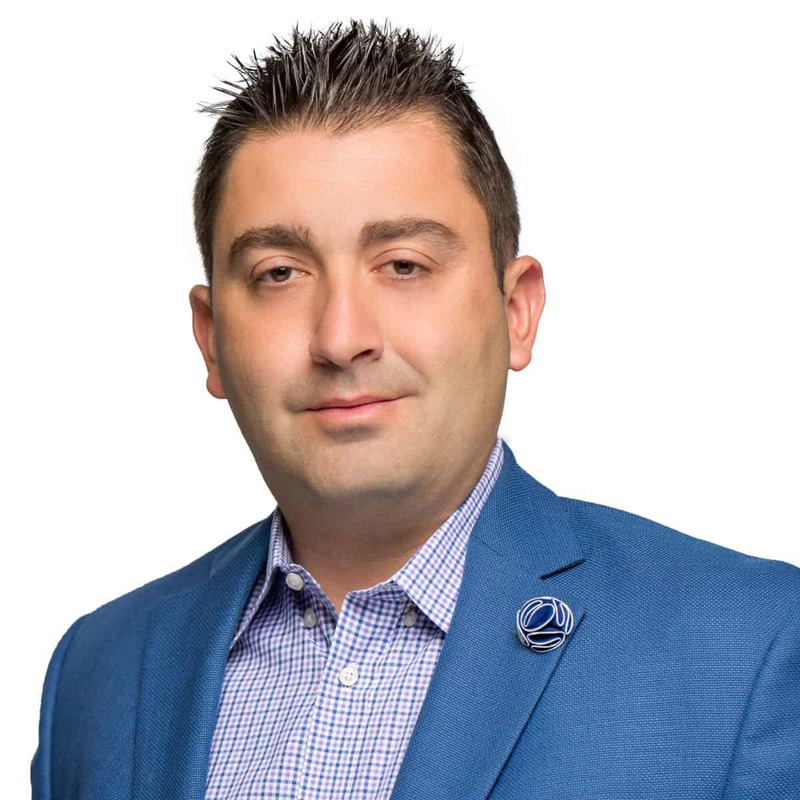 Following this, he began his career at TD Securities and CIBC before moving on to start Greybrook Capital with his partners Elias Vamvakas and Peter Politis. Peter is a partner at Greybrook Capital, a North American private equity firm, and the CEO of Greybrook Realty Partners, a leading real estate asset management firm with over a $1 billion in equity invested in real estate developments across Southern Ontario and South Florida. He is co-chair of Greybrook Realty’s Investment Committee and leads the firm’s deal origination and asset management practice. In his capacity as CEO, he has been involved in the acquisition of over 50 developments representing 32 million square feet of density and an aggregate completion value of over $14 billion. Peter also plays a critical role in the success of Greybrook Capital’s portfolio companies, serving on the boards of a number of Greybrook affiliated companies. He also serves on the board of Blu Genes Foundation, a charity funding the advancement of gene therapy sciences for the treatment of various genetic disorders.